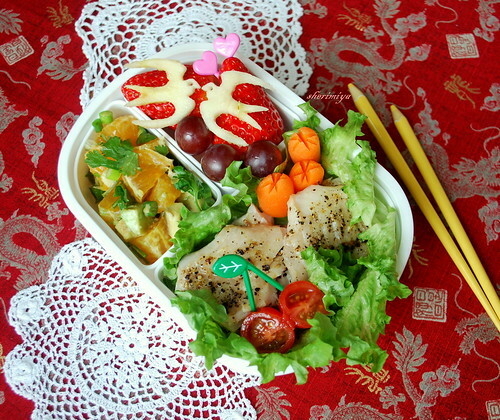 Fish & Salsa Bento, originally uploaded by sherimiya ♥. You can alter the proportions to personal taste, and add other things like shredded cabbage, celery for crunch, or tomato. The orange and lime gives a zesty flavor that makes me think of summer. If you were making real tacos, you would put some fish and a scoop of salsa in the tortilla -- that's what we did for dinner. It's really good, and the kids love to make them. In the fruit section he has two strawberries, some red grapes, and two "lovebirds" cut from apple with my new cutter. This detail makes it a Valentine's bento! And, it's also eligible for hapabento's RED B.O.M.B. contest! Those lovebirds are beyond precious! What a great new cutter. Thank you, you're so kind!! Beautiful bento and photo! Did you crochet those doilies? They're pretty. What a lovely bento! The lovebirds really set it off artistically. They look so wonderful and delicate :) Is the cutter easy to use? it looks like it might be a little frustrating with the tapering of the wings. Thanks a lot! I thought the same thing of this gentle bird, and had to have it. I used a crispy apple slice, and surprisingly the two birds came out cleanly in my first 2 tries. But I think you could also gently push out the wings with a rounded object if necessary. I've done that with my flower cutters. Wow that salsa sounds so fresh and zesty and I am so envious of your love birds! Thanks a lot Fluteloop! Lovebirds love you too! Looks delicious!! Yummy fish! And I love the birds they are so beautiful! Lovely love birds, they look so special and delicate perched atop the brilliant red strawberries! Mmmmm, will take note of this light and refreshing fish recipe! so lovely -- the birds are the prettiest valentine's touch! and i love the salsa recipe: the creamy avocado, the citrus, what a wonderful and delicious balance! Thanks Angi, Token, Jenn, bentobird, Pikko, and megan!